The Nova lathe is made by Teknatool International, a New Zealand-based company that specializes in woodworking tools and accessories. Many woodturners are familiar with Nova chucks, faceplates, centers and other attachments, but Nova also manufactures some fine woodworking lathes, too. At the time of this writing, there are only two Nova wood lathe models available, the 1624-44 and the DVR-XP. However, Nova is adding two more completely new models to the lineup in the fall of 2011. The Comet II will be a 12" x 16.5" midi lathe, and the DVR 2024 will be a 20" x 24" lathe designed for bowl turners. I will add information on the new models once they are out and have some owner ratings. Their current models have been out for a number of years and get excellent overall reviews. 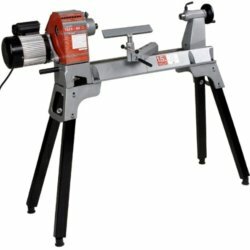 They are great quality machines that offer an excellent value in a woodworking lathe. The Nova 1624-44 has a 16" swing over the base and a 24" distance between centers. The bed on the Nova lathe is extendable in 20" increments. It comes with a 1.5 HP reversible motor and a 360-degree swiveling headstock that allows you to turn up to a 29" blank outboard. There are eight speeds available, ranging from 215 RPM to 3600 RPM on USA models, and from 178 RPM to 3000 RPM everywhere else. The headstock offers 24 indexing positions, and the motor uses regular household current. - I bought my Nova lathe a year ago, and am very happy with it... Overall it gets very high marks for quality, design, and value. - John A. The swiveling headstock seems to be the favorite feature of the Nova wood lathe. 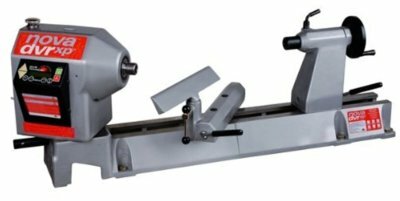 The reversing motor is also a popular feature, and a number of owners commented that it is easier to change the belt speed on the Nova 1624-44 than it is on many other woodworking lathes. As you can see from the comments above, many owners feel that this Nova lathe is the best machine you can get in its price range. Of course, there are a few complaints and shortcomings. The most common complaint is that the Nova wood lathe is not heavy enough (215 lbs. ), and the legs that come with it require a little bit of ingenuity to attach a shelf to add weight. You can get a set of cast iron legs for it, but that makes the price not as attractive. This Nova lathe only comes with a 12" toolrest, so for smaller work you have to buy a smaller toolrest also. A number of owners wish it had an electronic variable speed control, too. Sidenote: If you are new to woodturning or a veteran that is interested in getting more out of your lathe, there are tons of great woodturning books out there. The ones that are recommended most often for beginners on the woodturning forums are Turning Wood with Richard Raffan and The Lathe Book: A Complete Guide to the Machine and Its Accessories by Ernie Conover. I would recommend either of these books as an introduction to woodturning - I have an older edition of Richard Raffan's book and it has been a great resource for me as a beginning woodturner. Well, if you want variable speed control, you can always step up to the Nova DVR XP. The DVR XP uses the same bed and tailstock as the 1624-44, so it has the same capacities. The difference is in the headstock, which is an unusual design for a woodworking lathe. The Nova DVR-XP uses a direct-drive motor instead of a belt and pulley system. The motor is variable speed and reversible, and provides 1.75 HP when connected to a 110V power supply or 2.0 HP when connected to a 220V power supply. Like the 1624, it also has 24 indexing positions. The motor and its electronic speed controller on the DVR XP Nova lathe are fairly sophisticated pieces in comparison to many other woodworking lathes. Speed is variable from 100 RPM to 3500 RPM, and you use an "UP" or "DOWN" button to change the speeds. You can set up to five preset speeds throughout the RPM range, which allows you to "jump" to a higher or lower speed without having to scroll through the entire range while pressing a button. The controller on the Nova DVR XP lathe detects the weight of the workpiece and adjusts the performance according to what is happening at the moment. It will shut the motor down in case of a chisel dig-in, but under normal circumstances will maintain the same speed unloaded or under load. It also reduces energy consumption through use of the computerized controller that only supplies the motor with the minimum current necessary to maintain the speed of the spindle. Owners of the Nova DVR XP love the variable speed and say the machine is smooth, quiet and powerful. The swiveling headstock is a definite plus over many other woodworking lathes, as is the reversible motor. However, there are a few things you need to be aware of. There have been a few failures of the motherboard in the controller, usually when running the lathe on 110V instead of 220V. The Nova lathe does not produce as much HP when running on 110V as it does on 220V, and a couple of folks felt it was underpowered for its capacity when running on 110V. The most common complaint is that the speed changes are slow if you are scrolling up through the speeds instead of using the available presets. If you take the time to read the owners manual and then set up the presets, this isn't a problem. If you are looking at wood lathes in this size and price range, you also should take a look at the Jet JWL-1642EVS. It has similar capacities and many of the same features. The Jet lathe costs a little more, but the legs are included with the Jet, while they are an extra-cost option for the Nova. In the end, both of the Nova lathes appear to be a great choice. Their current models get great reviews, and owners feel that they are a great value for the money. To get detailed specs on all of the Nova lathe models, visit their website at Teknatool.com. I will do a separate page on the new models once they are out and some owners weigh in on them. In the meantime, based on actual owner opinions, it's hard to go wrong with a Nova lathe.